And now I find myself half-wishing I had been selected. When the jury summons came four months ago I was originally agitated, and deservedly so, because I was working two jobs at the time and had absolutely no time to devote to sitting around waiting for justice to possibly be served. I was amazed when I saw that I could postpone it without even giving a reason, and I gave absolutely no thought to when it would be postponed until. You know, until I got a second jury summons in the mail two weeks ago that said I was scheduled to serve — you guessed it — today. I did the antsy pants dance when I recognized the envelope because I knew what it meant. I couldn’t get out of this one. I only hoped it wouldn’t be one of those endless trials because I knew I would be bored out of my mind, and with my luck there was no way I wouldn’t be seated on a jury. For one, I know they look for a generous cross-section of the county, and for two, I just have absolutely no luck with this sort of random selection thing. 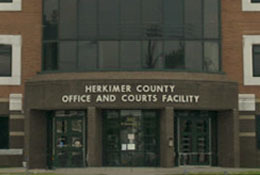 So I went down to the Herkimer County Courthouse today ready to spend six days at the least on a jury made up of my peers. And yet I’m home, and it’s only early afternoon, and I’m somehow not seated on a jury made up of my peers. Maybe my luck changed while I wasn’t paying attention, but the random nature of the jury selection process actually worked in my favor, and I walked out of that courtroom today after two hours of “service to the court,” meaning I stood around, then sat around, waiting for them to say my name. But they never said my name. Even after several prospective jurors were excused, and I kept thinking I was going to be next, they called others around me and left me untouched. Finally, after two hours, they had selected a jury of people who I doubt were my peers, although we live in the same county. 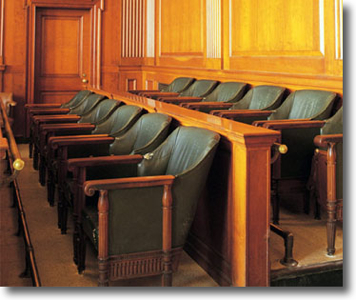 After hearing their life stories while I sat there hoping the court officer wouldn’t call my name next if they were excused, I had no doubt that those seated in the jury box would be impartial during the trial, and that I wasn’t needed. Then the judge dismissed the rest of us, thanking us for taking time out of our busy schedules to do our civic duty. And I half-wished I were staying. That feeling lasted just until I made it out to my car.